So yes, right now I’m supposed to be watching football playoffs! But, until I get some company in the family room (my son), I’m working on these pictures. I’ll catch the second half of the first game and watch all of the next game rooting for the GIANTS!! Anyway, today was just too cold and gloomy to go outside and take snowy shots. It was too tempting to stay inside and be warm. So I did, and I played with some macro shots of a beautiful Calla Lily plant I bought the other day. These blossoms are just so beautiful to photograph. Their curved lines just lend themselves to up-close shots. It was honestly hard to choose whether to post them in color or black and white, they look so pretty either way. I hope you enjoy them in black and white, which I chose since that’s what I’m working on in the class I”m taking right now. What do you think?? Off to make a fire and watch the games!! Go big blue! The website Flickr is so inspirational for me. I’ve been looking through so much amazing work posted by photographers from all over the world. The past few days I have seen some really interesting work with camera movement and with textures and filters. 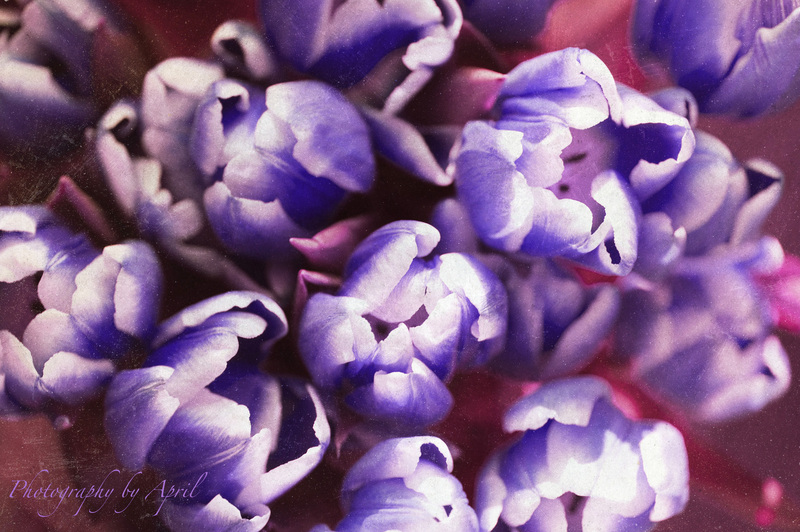 This spurred me on to take some of my photos of tulips from last week, which to me seem kind of boring, and rework the color and add some textures. 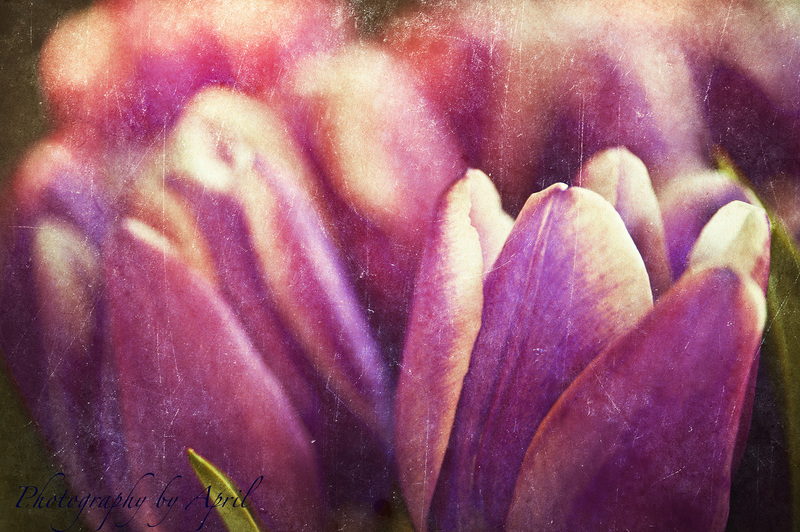 I think tulips lend themselves to this ‘older’ look. These are all the same bunch of flowers. I like this textured look with these flowers! I have two bunches of beautiful tulips which were brought to my daughter and me by a friend last weekend. 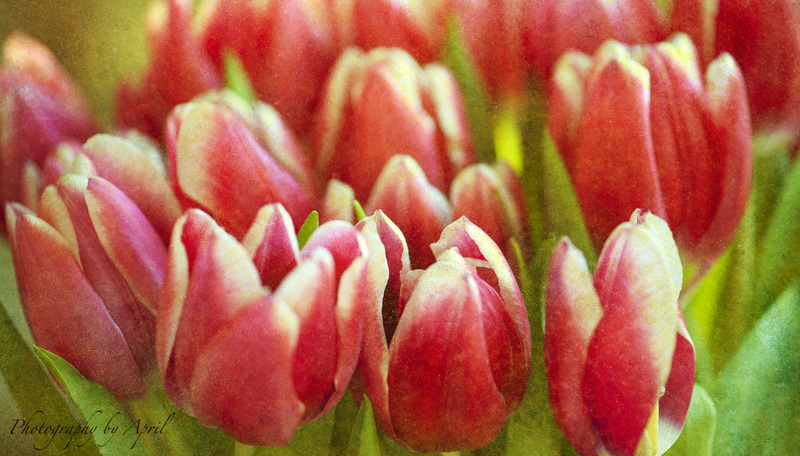 I wanted to photograph them, but in the past I have had trouble getting shots of tulips that interest me. They have all seemed, I would say, regular. (I have seen other people’s that I like, but none of my own.) So that got me thinking about what else I could do with these tulips, so I did some movement of the camera during the shooting. To me, these are not at all ‘regular.’ I think that’s what appeals to me about abstract photos in general. They make you think a little, figure it out, process what exactly is in the image. I have tried to figure out what it is that draws me to this type of photography and that’s the closest I can come. Abstract photos are interesting, unusual, and not what you see as you look around your world. I’ve never done a shot of flowers indoors with camera movement before, this was my first attempt. I think the lines of the tulip leaves especially, and the blossoms as well, lend themselves to this technique. Because of the curved lines in the leaf, the last shot is my favorite. What do you think?? This morning, I really didn’t have anything particular to post until I read a comment from friend of mine on my ‘Lights’ post. She mentioned that she loves reflections in water, and they definitely appeal to me as well. Couldn’t you just sit and stare at beautiful reflections in water? It is so relaxing. This got me thinking that the fall was a fabulous time, because of the beautiful colors, to shoot pictures of reflections in water and I had quite a few from this past season. These shots are all from around Westport, some recognizable locations, and some abstract shots. I suppose I need to get out and shoot more pictures now, but it’s much harder to get inspired with the landscape in the northeast right now. Maybe if we could get some snow I would get inspired to get outside!! Meanwhile, take a look back at the beautiful colors from this past fall. Someone bought one of my pictures! For me this was very exciting… someone actually wanted to purchase a print of one of my photos! Apart from the photos I have taken of people’s children, this was the first time someone wanted to have one of my prints as their own. One evening, friends of ours were over before going out to dinner and we and we were looking at different things on the computer. I happened to show them a few of my photos and one was requested! The photo is the one below. I had it printed nice and large and they plan to frame it. Thanks Ellmans!! !